Undoubtedly one of the finest properties on the island of Phuket, Villa Mayavee is a true architectural gem. This luxury private villa offers a contemporary home away from home set amidst the incredible lush forest on a secluded peninsula. Villa Mayavee is located on the west coast of Phuket, at Waterfall Bay on Kamala’s Millionaire’s Mile. Situated in an exclusive community, it is secluded from the crowded popular tourist sites, but also in close proximity to the island’s best beaches. The popular white sand beaches of Patong, Kamala, and Surin are a close distance, providing opportunities for guests to explore the island’s natural beauty while also staying close to the villa. The entire property encompasses 10,200 square meters of land, with the main building occupying 2,400 square meters of space. The building is a unique Z-style structure where guests are welcomed into a stone hallway upon arrival and directed up to a spiral staircase leading to the living areas and separate wings. Surrounding the property is a lush, tropical jungle that seems to embrace the villa. Both ocean and mountain views are seen from every angle of the rooms, as well as the outdoor lounge spaces. Floor to ceiling glass doors and windows welcome natural light to seep through, creating immaculate spaces for rest and relaxation. There are generally two wings to the villa – the guest wing, where 3 suites, the gym, and a pool are situated; and the master wing, where the master suite is located and separated from the rest of the guest rooms. The master wing is a private space that’s separated from the rest of the building by the kitchen and dining areas. It features an impressive dressing area, its own private pool, a library, and an office. The suite is a private retreat all on its own, which makes for the perfect accommodation for a couple while the rest of the family or friends enjoy their time around the rest of the property. This true architectural masterpiece brings the best of the modern world into the natural arena of Phuket’s beautiful tropical forest, while also offering incredible ocean views of the Andaman. Thanks for everything! The view is heaven. The feel is home. The staff is family. We will be back! In reality the villa looks so much better than in photos and video. We had a fun and very relaxing week. The staff at the villa are exceptionally attentive to all our needs. If you are seeking a modern sleek luxury villa for your holiday in Phuket, no doubt Villa Mayavee is the place. The long drive going to Villa Mayavee makes the wait all the more worthwhile. No way of getting around the fact that this place is the ultimate luxury getaway. Taxis needed to get to shopping and nightlife; one drawback of having ultimate privacy. That said we never wanted or needed to leave as all was catered to by the great staff. The living area is a 'glass tube' full of all we needed from TV lounge at one end followed by open plan kitchen-diner and then a chill out seating area. Light everywhere. And the stunning uninterrupted views of the sea and sky; priceless! The pool is inviting and separated from the living area by a winding staircase down. What I loved was that privacy which is available in all areas of the house, even with the house full go guests. We even walk down the cliff face to different viewpoints. The highlight was the sunroof above the master wing (there is a guest wing too!) for apéros at sunset. Breathtaking, every time. If there were 6 star ratings then I would give that. We have stayed in other villas on the island, but this villa is simply exceptional. 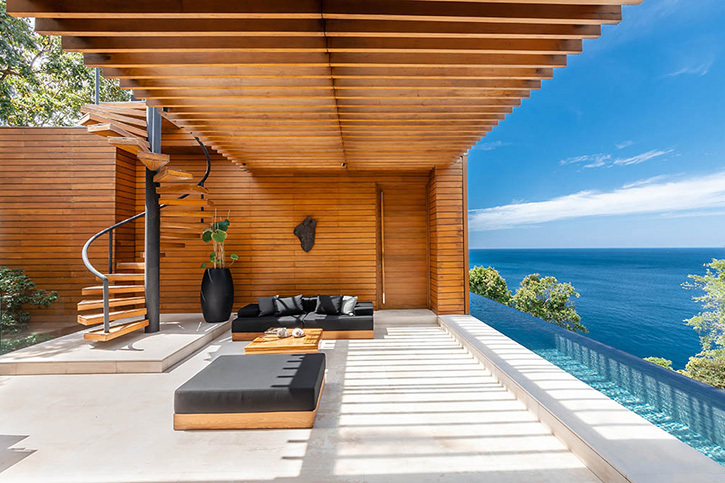 The location itself is incredible facing the ocean. We enjoyed both the sea view and mountain view. We feel it every secluded but in fact, we are only few minutes away to Kamala beach and Patong. The service from the staff was unforgettable. We loved our stay and will be happy to come back anytime!